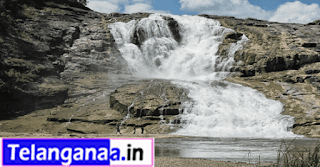 Around 261 kms from Hyderabad, is a very beautiful waterfall in the Adilabad district of Telangana. After reaching Nirmal you will have to travel a stretch of 10 Km of ghat road which provides you a thrilling experience through dense forest. If you love long and adventurous rides, this road is a must try. After travelling around 30 Km you will reach a village called Neredikonda. A right turn into a small road just after this village, takes you to your destination. One has to be a little conscious here as there is no sign board that directs to the waterfalls. After driving straight for around 10 Km, cutting your way through lush green fields, and a dense forest, your eyes will open up to heaven on earth. The place is hidden from the noisy external world and offers you the best of nature. It is covered with valleys, dense forest, and chirping birds. After entering the area, you will have to walk around half a kilometer and you will reach a place where you find a series of 408 steps down to the waterfalls. 408! But a little effort may heal your heart. And then, you gaze at the amazing waterfalls. One simply falls short of words to describe this untouched beauty. To add adventure, you can enjoy trekking though big boulders to reach the footsteps of the waterfalls. The water gushes through rocks making its own path from a height of 200 feet and splits in to multiple streams. While there are many such scenic waterfalls, this one is just so amazing and very accessible. Climbing up further to reach to top of falls may seem as a good idea, but one has to be very careful as it is too steep and very risky. Kuntala waterfalls is located at a distance of 270 km from Hyderabad and 42km from Nirmal town and is accessible by road. is a 1000 acre park with igneous rock formations between pools of water.